Project I-MaP aims to research, develop and simulate the implementation of a systemic and holistic Mobility Management Model for metropolitan areas, developed and implemented in a co-creative approach, joining and correlating needs and expectations of different user communities in the cities. The objective of the Model is the increase of multi-modal transport use and the promotion of sustainable mobility, while connecting urban areas and their surrounding territories, preserving social inclusion, understanding the mobility behaviour of user communities, developing methodologies promoting cooperation between citizens and decision makers, and generating new business ideas and local services. While following the guidelines of the SUMP, I-MaP will achieve its objectives by ensuring a participative, systemic and locally adapted strategy, developing a systematised methodology, the research and development of instruments (and digital tools) and by establishing expert networks. As the I-MaP concept includes its own monitoring and evaluation tool (based on the Asset Management approach), it also regulates and controls the objectives during the project’s course, in order to systematically adjust and improve the non-working parameters. Resulting from an interdisciplinary and transdisciplinary perspective, the Mobility Management concept represents a participatory, interactive approach of co-creation involving all relevant stakeholders (from within the local administration and beyond, civil society, private sector, associations) into the process of urban transition. A mobility management plan along these lines ensures a better success for technologies, transport and urban planning, and a better cooperation between parties involved. The multi-dimensional, participative and transdisciplinary approach, as well as the innovative and rich aspects of its controlling system, make I-MaP’s Mobility Management Model particularly suitable to address scopes 1, 2, 5 and 6 of this Topic. The I-MaP: Intermodal Mobility Management Plan project aims to research, develop, implement and validate instruments, guidelines and a systemic and holistic model of mobility management for sustainable mobility in urban areas, adapted to the specific cultural and infrastructural requirements of cities, while following the guidelines of the Sustainable Urban Mobility Plan (SUMP), set out by the 2013 Urban Mobility Package, in a complementary approach. The objective of the Model is the increase of multi-modal transport use and the promotion of sustainable mobility, while connecting urban areas and their surrounding territories, preserving social inclusion, understanding the mobility behaviour of user communities, developing methodologies promoting cooperation between citizens and decision makers, and generating new business ideas and local services. I-MaP will achieve its objectives by ensuring a participative, systemic and locally adapted strategy, developing a systematised methodology, the research and development of instruments (and digital tools) and by establishing expert networks. The project will be developed by a consortium of Researchers, Policy Makers, Industry/SMEs and Civil society, who will join knowledge, competences and networks in a collaborative open innovation approach to determine methods and processes for the modelisation of a local relevant mobility strategy, and in cooperation with the cities of Gelsenkirchen (Germany), Münster (Germany), Prague (Czech Republic), Sofia (Bulgaria), Dijon (France) and Martin (Slovakia), each distinctive context adding valuable inputs and enriching parameters and variables. The Mobility Management Model, main deliverable of the project, is to be guided and conducted by a Mobility Management Team, appointed in each city where the model is to be applied, who will supervise the planning and development of intermodal transport and spatial planning in urban areas, organise open-innovation laboratories (methodical workshops for technology, infrastructure and service research and development with the help of crowd-intelligence and adapted to the special needs of user-communities), coordinate a participative network (including experts, citizen associations, end users, local decision-makers, engineers, architects, companies), as well as ensure the involvement and inclusion of heterogeneous groups of inhabitants along the process. The intended Mobility Management Model is therefore based on co-creative open innovation processes, it assembles and disseminates all relevant information on needs and conditions in the different cities (the exchange of information and experience among the cities is an added value which should enrich the innovation processes). By implementing a model of mobility management, the project follows the objective of promoting sustainable mobility, via the regulation and decrease of the use of private transport in favour of multi-modal transport. The Model will be set to target an increase of 10 to 20% (depending on the initial situation and on the city) of intermodal transport use in the urban regions targeted. The sub-objectives of the project answer different needs and challenges from the target cities. The target cities cover various existing shortages and they combine multiple parameters in order to test the Mobility Management Model in different configurations. Both differences and common aspects of initial conditions and needs in the participating cities, will create a heterogeneous pool of parameters which is used as framework for the co-creative and innovative development of solutions. - The Ruhr area (Gelsenkirchen, Germany) is a multi-centres urban area. Because of its metropolitan situation, it brings the challenge of connecting the centres and of solving the primary use of personal transportation in the saturated regional road network. - Prague and Sofia face a commuter belt challenge; there is a lack of transparency between the actions undertaken, between decision makers and end users/citizens, and a lack of articulations between the actions and the political measures. - Münster is a mono-centre city. It has an important bike mobility, culturally and socially installed but lacks the infrastructure to face the importance of the bike mobility development. - Dijon is also a mono-centre city that went through recent spatial and extreme urban changes. The city endorsed a new urban mobility plan and can contribute to show best practice examples. As a newly designed metropolis (French government attributed it the “metropole” label on April 28th 2017), Dijon is currently operating the change from an intermediate city to a bigger city or urban area and can profit from more financial support for mobility development. - In Slovakia, the infrastructure and the network enable the experimentation on the concept of a mobility management plan/model, both on a local level (city of Martin, about 60,000 inhabitants) and on a regional level (Self Governing Region of Zilina which covers about 700,000 inhabitants). One of the specific objectives of the project is to experiment with the Mobility Management Model on different configurations and to collect information, data, knowledge, skills and best practices, to link them, and to develop and propose a model as relevant as possible to its environment and capable of answering several different local challenges. The model is to be equipped with adequate tools to ensure a common standard of quality and to guarantee this standard the Asset Management approach will deliver the necessary means. As the I-MaP concept includes its own monitoring and evaluation tool (based on the Asset Management approach), it also regulates and controls the objectives during the project’s course, in order to systematically adjust and improve the non-working parameters. The proposal relates to topic LC-MG-1-2-2018, “Sustainable multi-modal inter-urban transport, regional mobility and spatial planning”, under the part “Smart, green and integrated transport” of the work programme. Users who live in cities have nowadays several possibilities to adopt a “green” mobility. However, commuters who need to use different kinds of transports still prefer to use their private vehicles, because of organisational, functional and personal considerations. Consequently, one of the biggest polluters and emitters of CO2 are individual vehicles: 70% of CO2 emissions in urban areas are caused by traffic (BAUM, 2013, p.70). It is, therefore, a key challenge to develop a sustainable mobility and transport system corresponding to the culturally based mobility behaviour, so that air pollution, climate change and the unbridled consumption of resources is counteracted, without restricting the mobility and quality of life within urban spaces. Mobility, particularly in local areas, must be secured, sustainable, low emissions and affordable. Therefore, not only has the development and promotion of relevant concepts been given special attention in current applied research (BMBF, 2015), but also intermodal passenger and freight transport projects and numerous initiatives. Already in the Danube region, the first signs and options for the development of sustainable mobility are evident. E-bikes are highly popular in many areas, e.g. in Prague sightseeing tours are offered (e.g. Premier Prague Tours, Prague by e-bike, Prague eBike Tours & Rental), although they are at different stages of development and are not networked in most cases. Urban areas often lack appropriate infrastructure to allow sustainable mobility, and the existence of intermodal services, with the exception of commuting cities, is lacking. Transport and mobility as well as urban spatial planning are mostly not related to the specific, culturally based mobility behaviour of the user communities. And yet, the behaviour of inhabitants of large cities is influenced by a lack of suitable sustainable-based solutions. In Prague and Sofia, there is a great need for sustainable mobility concepts, adapted to the specific urban conditions. The offer of an alternative transportation option (e.g. Shared transport) from the suburbs to the inner cities (e.g. to work or to schools) is missing almost completely. Therefore, there is a significant need for the development of sustainable mobility concepts in local spaces (see UN, 2010a, p.13; UN, 2010b, p.6). The initial situations show that private transport leads to congestions in cities and city lines collapse because of traffic (Prague as an example). Commuters not only need to circulate outside the city but also inside the city, they consequently need an attractive offer that combines a multi-modal transport adapted to their need. In order to support inter-modality, the gap between the different kinds of transport used and other considerations must be solved. This can be done by developing adapted to end users technologies, services and the integration of potential users to the process in an open innovation approach, in which the cultural aspect is implemented by users themselves. Resulting from an interdisciplinary and transdisciplinary perspective, the Mobility Management concept represents a participatory, interactive approach of co-creation involving all relevant stakeholders (from within the local administration and beyond, civil society, private sector, associations) into the process of urban transition. The Mobility Management Model ensures a better success for technologies, transport and urban planning, and a better cooperation between parties involved. The multi-dimensional, participative and transdisciplinary approach, as well as the innovative and rich aspects of its controlling system, make I-MaP’s Mobility Management Model particularly suitable to address scopes 1, 2, 5 and 6 of this Topic. The overall concept underpinning I-MaP is the research, development and simulation of implementation of a systemic and holistic mobility management model for metropolitan areas, developed and implemented in a co-creative approach, joining and correlating needs and expectations of different user communities in the cities. While following the guidelines of the Sustainable Urban Mobility Plan (SUMP) (set out by the 2013 Urban Mobility Package), I-MaP offers a complementary approach by ensuring a participative, systemic and locally adapted strategy. It supports organisations and institutions to implement a SUMP, thanks to a systematised methodology, the research and development of instruments (and digital tools) and expert networks. As the I-MaP concept includes its own monitoring and evaluation tool (based on the Asset Management approach), it also regulates and controls the objectives during the project’s course, in order to systematically adjust and improve the non-working parameters. While actual measures and politics lack collaborations with the different stakeholders and don’t systematically involve local populations, the concept of a mobility management plan results from an interdisciplinary and transdisciplinary perspective. It aims at the involvement of heterogeneous knowledge from experts and key actors, and at the integration of the various levels of social life by implementing co-creative workshops and developing innovative ideas and new services. The Mobility Management concept represents a participatory, interactive approach of co-creation involving all relevant stakeholders (from within the local administration and beyond, civil society, private sector, associations) into the process of urban transition. A mobility management plan along these lines would ensure a better success for technologies, transport planning, and a better cooperation between parties involved. A first network of experts and researchers on a European level reached out to or developed local networks of different stakeholders in each partner country. Therefore, in each city the project partners can count on a sustainable network of key actors in the field of mobility. The subprojects join interdisciplinary research partners, communal partners of city administration, policy makers, corporate and private partners interested in developing sustainable mobility solutions in order to improve the quality of city life, SMSs offering mobility services, a network of NGOs, initiatives and projects working in the field of sustainable mobility and mobility experts. c- Conceptualisation and development of training and coaching programmes through social and cultural approaches, offered to the local population/citizens, as well as to the stakeholder and decision makers. To facilitate implementation, the Mobility Management Team will need special tools (survey tools, software solutions for the management of data, creative techniques, didactic concepts…), which will be gathered in a Mobility Management Toolbox. The Toolbox in conjunction with several guidelines will be an important practical output of the project. The elaboration of the Mobility Management Model, its toolbox and the progress of the project will be monitored and evaluated following an Asset Management procedure. It is one objective of the project to develop this procedure and tool in order to guarantee the holistic and systemic character of the model, while being able to control at the same time its own progress. Finally, the Mobility Management Plan will be modelled, its implementation in local environments (which will be determined during the project, on a district level or even on a city level in the case of Münster or Gelsenkirchen) simulated and submitted to test by different citizen groups. The model will be then delivered to different municipalities and decision makers, who will decide on a possible implementation. For the duration of the project and its testing phase, Mobility Management Teams carry out the model. Those teams can be located on different levels in the participating cities (communal or private actors). Together they supervise data collection and management (analyse and diagnostic of mobility), coordinate the different experts, actors and decisions makers, and conduct open innovation labs (during workshops). The result of co-creative workshops leads to the development of technologies, infrastructures or services adapted to the local context and the need of citizens and stakeholders. Experts establish then a spatial planning and supervise its implementation. The last step is monitoring, assessment and evaluation of the implemented mobility plan, infrastructure, technology or services. The implementation has to respond to the standards set in the Asset Management concept. Depending on the chronology of the process, the Mobility Management Team either takes care of the controlling or attribute experts to it. Parallel to this process, the Mobility Management Team has the task to coordinate a participative network, to increase visibility (on decisions, on projects, on measures, on civic movements…), communication and acceptance amongst all the parties involved during the implementation process (before, during and after) and to enable feedback possibilities. The Asset Management is a strategic, systematic process of operating, maintaining and improving physical assets, the process itself and outputs. It is self-regulated and follows an agile approach, which allows to modify targets and to improve measures. It enables strategic decision-making and support urban and spatial planning, environmental protection and evolving mobility needs. Originally developed in the United States of America and in Canada, a version of the Asset Management dedicated to transport (“Transportation Asset Management Plan”) already exists and is being used and experimented on by multiple organisations under US DOT (such as the Federal Highway Administration, the National Cooperative Highway Research Program and several State transportation agencies: Florida, Michigan, Minnesota, Ohio, Oregon, Utah and California), however it has yet to be adapted to European needs. I-MaP plans to connect with those transportation agencies to exchange Best-Practices, Know-How and experiences. Because I-MaP aims at the research, development and testing of the model and will lead to a modelisation and simulation of the implementation of the Mobility Management Model in the six different target cities, it is positioned on the level 4 (TRL 4) – technology validated in lab –, in reference to the Technology Readiness Level (TLR). In Germany, not only has the development and promotion of relevant concepts been given special attention in current applied research (BMBF, 2015), but also intermodal passenger and freight transport projects and numerous initiatives e.g. ruhrmobil-E, RUHRAUTOe and competence centres like Electro mobility NRW, 2014. They are supported by many ICT-based groups (Molecules/Berlin), with the aim of changing behaviour in the individual user towards using instead of owning vehicles. In Prague and Sofia, bike communities and E-bikes are highly popular in many areas. In Sofia, associations are active and engaged in dialogue with decision makers. In Dijon, a new mobility scheme proposes relay parking for citizens living in the periphery, giving them the possibility to leave a personal vehicle on the city borders and to travel inside the city with public transport. This measure is also proposed during major events (concerts, football games) to reduce dense traffic. The use of bicycles has been increased thanks to new services such as self-service stations, short and long-term rentals related to conventional subscriptions (bus and tram), or secured parking areas for personal bikes (Bonnet, Pilarski, & INSEE, 2017). - Diagnostic and analyse of the needs, the local mobility politics and requirements (infrastructure and geographical specifications) in the target cities by collecting quantitative data: traffic monitoring, use of geolocalisation, communication and telematic data from the European Global Navigation Satellite Systems programmes (such as Galileo and EGNOS), questionnaires and surveys; and qualitative data: interviews, roundtables, participatory observations, documentary analysis, discourse analysis and case studies. - Analyse of cultural specificities in mobility behaviour and culture through socio-psychological methods; identification of needs to make sustainable mobility solutions more visible and more attractive. - Definition of common standards of sustainable mobility to design the Asset Management tool. - Identification of potential groups that need to be brought together (roundtables with citizens on a regular basis, local actors, decision makers, experimenting groups going into the field, moderated dialogues between those groups in an institutional framework (such as in think tanks)). - Need to differentiate and to determine the various layers of interests: end users (employees, commuters…), companies (they are interested in accessible ways to their offices and employees being on time), service providers and inhabitants (repercussions of traffic jams, in terms of noise and air pollutions, compromise between infrastructure development and preservation of cultural and historical city centres…). - Development and testing of an adapted mobility strategy and spatial planning, development and testing of innovative services or technologies. - Adaptation based on feedback from the results and the monitoring. - Simulation of the model for replication to other cities, exchanges and transfer in a European shared Best-Practices approach, benchmarking. - Development of an Asset Management Tool to ensure quality and standards. The project I-MaP gives priority to interdisciplinary and transdisciplinary work; all the partners and the cities contribute to the development of the model according to their expertise. This reinforced cooperation subscribes to the idea of shared knowledge in a European research and development network and to the transfer of Best Practices between European cities, as foreseen by the Sustainable Urban Mobility Plans guidelines. The FIAP e.V., the team from Bulgaria (the New Bulgarian University, the Institute for the Study of Societies and Knowledge at Bulgarian Academy of Sciences and the SHTASTLIVETSA Sofia Civic Association) and the Wuppertal Institute will realise a state of the art of the scientific literature as well as a diagnostic and analyse of the initial situation in the target cities. With the contribution of the Bulgarian partners regarding their expertise on citizen’s involvement, and by using their joint expertise on service development, open innovation, crowd intelligence, market analysis and business plans, the FIAP e.V. with the help of PEDAL Consulting from Slovakia will then research and develop a culturally adapted methodology to conduct participative and co-creative innovation workshops with local stakeholders and citizens in the different cities. 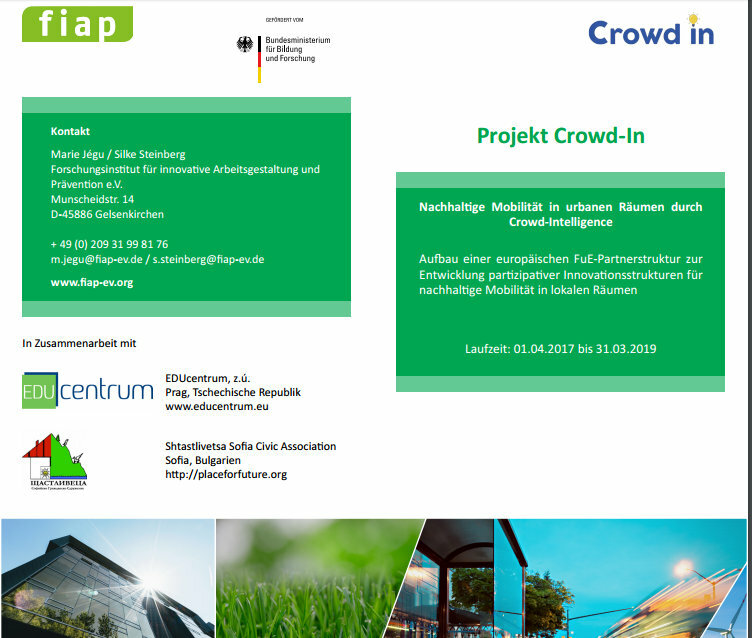 Based on the result of the diagnostic and analyses of the needs and also based on the results of participative innovation workshops, the consortium will then develop the model of the Mobility Management Plan, with inputs from the Wuppertal Institute, the FH Münster – University of applied sciences and a team from the municipality of Münster (transport and construction department) as technological and infrastructure guarantors. Both teams from Münster are also experts in developing Asset Management tools in the field of mobility. Asset Management is a strategic, systematic process of operating, maintaining and improving physical assets, the process itself and outputs. It follows an agile approach, which allows to modify targets and to improve measures. In parallel, the Laboratory Psy-DREPI (University of Burgundy), the Réseau Recherche Innovation Transition, MSH (University of Burgundy) and GRM SCIC SAS, will deliver inputs on social and cultural aspects (social psychology, stereotype, change management, identity strategies, appropriation vs. acceptance, group dynamics, social representations and intergroup relations). Their work also applies to all the cities included in the project, which allows thematic focus while linking the different fields of experimentation but also a meta-analysis on the cultural specificities that enable or block certain exchanges of “good practices” between cities. The EDUcentrum, z.ú. from Prague, will be in charge of supervising the development of a training/coaching programme since EDUcentrum team has got a long-term experience in both theoretical research in the field of education as well as in practical training course design, development of methodologies and implementation of coaching programmes in different areas. The whole consortium will deliver a model of Mobility Management with a simulation of implementation, based on local needs, and in addition to this, the departments of communal traffic in the different cities involved in the project offer fields of action for implementation. The project has an innovative component because it is based on an interdisciplinary and transdisciplinary approach, independent from classical repartition of tasks and isolation of experts working on their own. The approach wishes to increase efficiency through citizen participation and networking, shared knowledge, shared competences, crowd intelligence, transparency of needs and perspectives. The open innovation laboratory or workshop method enables the research and development of innovative services, new products and business ideas, technologies, new and adapted infrastructures. It also follows a side objective: the empowerment of citizens and a gender equal contribution of participants, by integrating citizens and local inhabitants to the development process and by including them into the planning of a sustainable mobility in their urban areas. I-MaP has also the ambition to develop a functional and sustainable expert network promoting multi-modal inter-urban transport, spatial planning and sustainable mobility, dedicated to experience transfer, replicability, Best-Practices diffusion and support to local needs. The Mobility Management Model, its instruments and the Asset Management approach represent new organisational models, inexistent yet on the European market. Through the research, development, testing and implementation of the locally and culturally adapted Mobility Management Model, the project contributes to a better acceptance and appropriation of multi-modal transport, it develops new mobility solutions and innovative, sustainable services ideas in a co-creative approach and therefore reduces the environmental impact of commuting and inter-urban transport. While doing so, the project increases “inter-modality and higher resilience of the transport system between the metropolitan region and the neighbouring cities and rural areas” (Impact 3 of the Work Programme). The project I-MaP will set the Model to target an increase of 10 to 20% (depending on the initial situation and on the city) of intermodal transport use in the urban regions targeted. The most important output of the project will be the innovation Mobility Management Model and its toolbox. The interactive and participatory character of this model and its tools will contribute to the implementation of a sustainable, socially rooted mobility culture in urban areas. Five to ten workshops in each target cities are planned. Scientific publications, as well as user-oriented, application related articles and information will contribute to the diffusion and reporting of the projects’ results and are foreseen in the deliverables. In each city, public events will help to involve inhabitants and to disseminate the new mobility services and structures. The establishment of a coaching programme for end-users, of an open innovation workshop methodology for service providers and of a Mobility Management Model for engineers and politics will be also part of the deliverables. The development and use of a methodology for co-creating innovative services, supporting participation to intermodal development, and the establishment of a model locally adaptable (to support mobility and to connect areas, urban and surroundings, in order to promote sustainable mobility, by increasing end-user acceptance and appropriation) will impact the behaviour and acceptance of citizens and stakeholders toward measures supporting sustainable mobility. - reducing “congestion, energy, emissions of air pollutants, carbon footprint, noise and land-use within” Prague, Sofia, Gelsenkirchen, Münster, Dijon and Martin, as well as other cities, by promoting inter-modal mobility and by offering a viable alternative adapted to the needs of the local context (Impact 1 of the Work Programme). By integrating the future end-users to the planning process and to the design of a new mobility for their city, this project ensures a better appropriation and acceptance of sustainable mobility, which will reduce the impact of traditional mobility on the environment. - increasing “coordination between multimodal infrastructure mobility and spatial-economic development, including reduction of inequalities” (Impact 2 of the Work Programme). By offering and dedicating a spatial and organisational structure (the Mobility Management Model), the project targets specifically the improvement of the coordination between multimodal infrastructure mobility and the spatial-economic development. Contrary to personal means of transportation, multimodal transportation and multi-modal infrastructure reduce the surface needed for transport of persons. Therefore, the surface can be freed to integrate into a green urban planning (parks and green spaces, pedestrian and commercial sectors…). Furthermore, in the objective of reducing inequalities and exclusions, the Model will include citizens’ interests in its processes and aim to connect the different parts of urban areas between each other. Finally, the development of new technologies and services will strengthen the local economy and open new business models, as well as contribute to job development. Indeed, customer-driven innovation processes for intermodal transport will develop new sustainable-oriented services. New software solutions (for Mobility Management Team) and Applications (for end-users) will be developed to support the Mobility Management Model. - Due to the co-creative and participative character of the project, I-MaP will make a considerable impact on the mobility culture and on mobility behaviours in the different cities. Instruments developed and tested by social sciences will measure this impact. - For each city, an analysis of acceptances and resistances towards sustainable mobility solutions will deliver valuable intervention possibilities to facilitate and improve implementation. Hawig, D. (2017). Wie Kunden mit innovativen Dienstleistungen den Elektroautos zum Durchbruch verhelfen. In R. Große, D. Hawig, M. Jégu, R. Klatt & S. Steinberg (Eds. ), Elektromobil durch die Zukunft: Zukunftsszenarien und neue Dienstleistungen für die Elektromobilität 2030 (pp. 188-209). Simon, H. A. (1996). The sciences of the artificial. MIT press (3rd Edition). Steinberg, S. (2017). Shared Creation – Kollaboration als Paradigma gesellschaftlicher Wertschöpfungsprozesse. In R. Große, D. Hawig, M. Jégu, R. Klatt & S. Steinberg (Eds. ), Elektromobil durch die Zukunft: Zukunftsszenarien und neue Dienstleistungen für die Elektromobilität 2030 (pp. 188-209). Work Programme 2018-2020, Smart, green and integrated transport.